A Zeugnis (Inspired Testimony) is a direct communication from God, delivered through a Werkzeug (Instrument). A Werkzeug is a person, in a state of inspiration, through whom God sends His message to His people. Zeugnisse usually are delivered orally (Aussprache) through a Werkzeug and recorded by a scribe. Occasionally a Werkzeug will deliver a Zeugnis himself or herself in written form (Einsprache). Zeugnisse (sometimes called Bezeugungen) are considered of equal spiritual authority to the Bible (but a Zeugnis does not supersede or contradict the Bible). Zeugnisse, along with the Bible, constitute the central source of knowledge that guides and directs Inspirationist belief, thought, and action. Zeugnisse are often, but not always, preceded in a Werkzeug by involuntary internal and external agitations or stirrings, called Bewegungen. These Bewegungen rise out of a profound internal stillness, and can range from subtle feelings of warmth and intense spiritual joy all the way to vigorous physical agitations and ecstatic shouts. A Werkzeug experiencing Bewegungen is literally being moved by the Spirit. 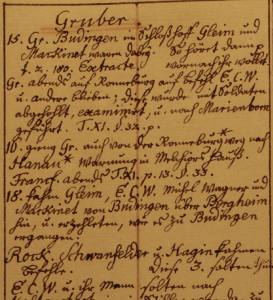 Archive records show that nearly 4,000 Zeugnisse were delivered by Inspirationist Werkzeuge during the 35 years between 1714 (the founding of the Gemeinde der Wahren Inspiration) and 1749 (the death of Werkzeug Johann Friedrich Rock). 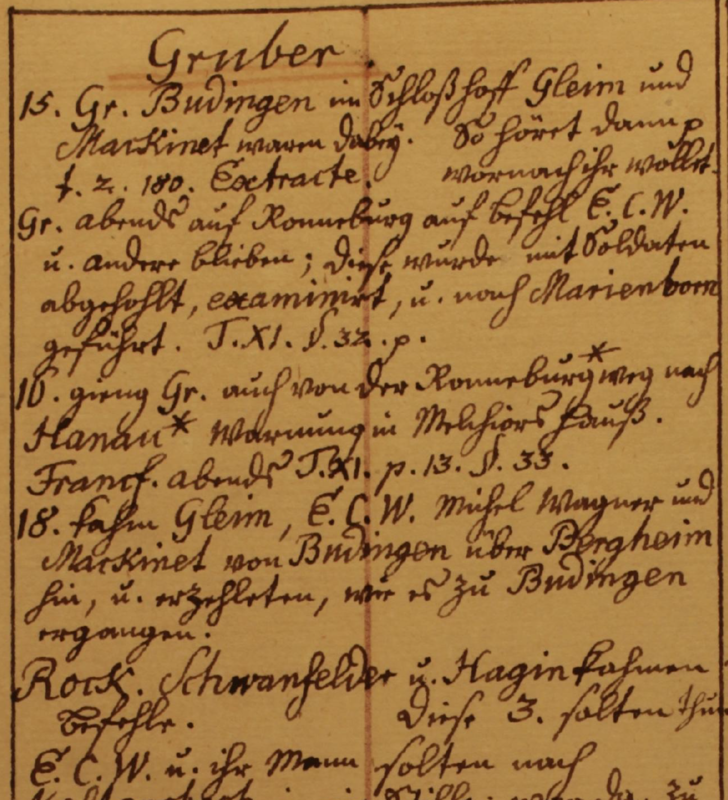 The first systematic attempt to catalog all existing Zeugnisse was carried out in the late 1750s in Germany, resulting in the remarkable Haupt=Register aller Bezeugungen des Geistes des HErrn vom September 1714 biss den 2nd Martii 1749 (Main Register of all Testimonies of the Spirit of the Lord from September 1714 until March 2, 1749). The Haupt=Register, a 367-page, bound manuscript, was the work of Paul Giesebert (P. G.) Nagel, an Inspirationist leader in Neuwied. The Inspirationist Archives project would hardly have been imaginable without Nagel’s Haupt=Register. A second attempt to inventory all 18th Century Zeugnisse was begun in 2017, more than 250 years after the first Haupt=Register, at the Amana Church Society Archives. 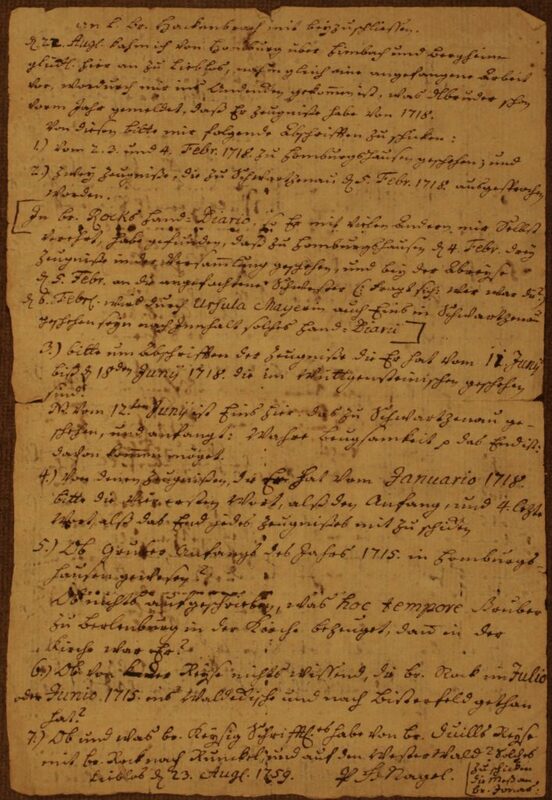 The primary goal of this Neues Haupt-Register is to determine how many 18th Century Zeugnisse (in either manuscript or printed form) are housed in the Archives. Published in 2018, the online Neues Haupt-Register presently contains 3,950 testimony entries. Of the 3,950 testimonies, we have located in the Church Archives more than 99% of the testimonies cited in the 1762 Haupt=Register. Only 27 Zeugnisse listed in the original Haupt=Register are currently “unaccounted for.” We are especially indebted to those individuals in the 18th and 19th centuries who copied and recopied many of the testimony manuscripts. Additionally, we discovered in various Archive manuscripts 51 testimonies that are not listed in the original Haupt=Register. Of the 3,950 testimonies, 38% have been printed, and 6% translated into English. 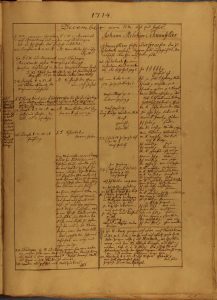 The Neues Haupt-Register references the manuscript or printed text for each Zeugnis in the Archive, making it possible to quickly find a particular Zeugnis. It also indicates whether a Zeugnis has been transcribed into modern German and/or translated into English. 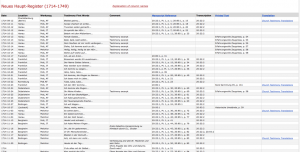 Links to digital texts of the translations are provided. 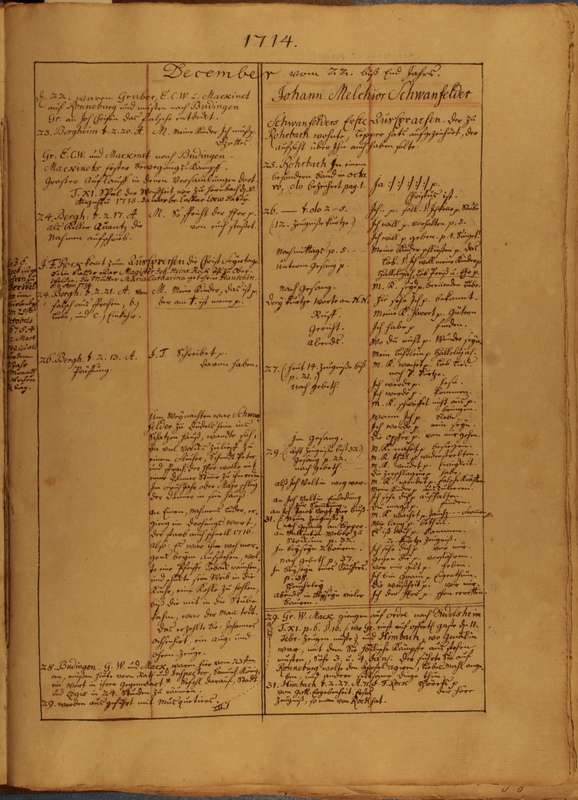 The original Haupt=Register lists nearly 4,000 testimonies chronologically, providing date, location, Werkzeug, first and last words of the pronouncement, and references to where it can be found, both in manuscripts and in printed works. A note on the circumstances of the testimony and whether it was directed toward a particular individual or group is often added to the entry. As a detailed record of the travels, worship services, and both internal and external conflicts of the community, the Haupt=Register provides an invaluable chronology and context to the 18th century origin and evolution of the Community of True Inspiration in its first 35 years. Furthermore, it provides a framework for understanding all other documents, letters, narrative accounts, and polemical works produced by members of the community at that time. Given the scope and significance of the Haupt=Register, it is curious that we have found no reference to it in any contemporary documents or later historical accounts. Even Gottlieb Scheuner, 19th century historian of the community who had access to many original sources, makes no mention of it. The Haupt=Register—like so many other Inspirationist works—has an anonymous compiler. Nevertheless we can fairly confidently state that it was compiled by P.G. Nagel in the late 1750s and completed in 1762. Paul Giesebert Nagel was born in Esslingen in 1716. His father was a lawyer and he also studied law. However, Nagel chose not to practice the profession and instead withdrew from worldly matters to lead a quiet and pious life. He became acquainted with the Community of True Inspiration and joined the community in Neuwied in 1740. After J.F. Rock’s death in 1749, Nagel, along with Jonas Wickmark in Lieblos, assumed leadership roles in the community. He, Wickmark, and others continued the visitational travels from congregation to congregation, helping to unite the disparate Versammlungen into one community. Nagel and Wickmark were also instrumental in collecting and publishing the testimonies of Rock, Gruber, Gleim and Mayer, as well as various accounts of the lives and deaths of community members. It is fair to say that without the extensive travels and publication efforts of Nagel and Wickmark, the Community of True Inspiration would not have survived for long after Rock’s death. Nagel died in 1779, and Wickmark seven years later. For example, this fragment of a letter from P.G. Nagel to Br. Hackenbrach, dated 23 August 1759, contains a list of Zeugnisse manuscripts that Nagel is requesting. And we also learn that Wickmark was assisting Nagel in the project. An L[ieber] Br. Hackenbrach mit beyzuschliessen. Den 22 Aug kahm ich von Homburg über Himbach und Bergheim glücklich hier an zu Lieblos, nahm gleich eine angefangene Arbeit vor, wodurch mir ins Andencken gekommen ist, was H[errn] Bruder schon vorm Jahr gemeldet, daß Er Zeugnisse habe von 1718. 2.) Zwey Zeugnisse, die zu Schwartzenau den 5 Febr 1718 ausgesprochen werden. 3.) bitte um Abschriten der Zeugnisse die Er hat vom 11 Juny biss den 18 Juny 1718 die im Wittgensteinischen geschehen sind. Vom 12 Juny ist Eins hier: das zu Schwartzenau geschehen, und anfangt: Wahre Beugsamkeit p das End ist: davon kommen möget. 4.) von denen Zeugnissen, die Er hat vom Januario 1718, bitte die vier ersten Wort, als den Anfang, und 4 letzte Wort, als das End jedes Zeugnisses mit zu schicken. 5.) Ob Grubers Anfangs des Jahres 1715 in Homburgshausen geschehen? Ob nichts aufgeschrieben, was hoc tempore Gruber zu Berlenburg in der Kirche bezeuget, dann in der Kirche war Er? 6.) Ob von der Reyse nichts wissend, da Br. Rock im Julio oder Junio 1715 ins Waldeckische und nach Bitterfeld gethan hat? 7.) Ob und was Br. Keysig Schriftliches habe von Br. Duills Reyse mit Br. Rock nach Runckel und auf den Westerwald? Solches zu schicken die Maß an Br. Jonas. The Nagel correspondence, which includes requests for information on the early testimonies to J.A. Gruber in Pennsylvania, further shows that Nagel was very concerned that the corpus of divine testimonies might be lost and was therefore seeking information and sources to compile his register of all testimonies. We also find partial drafts of the register among his papers. While the Haupt=Register is undated, internal clues corroborate the dates from the Nagel correspondence. We note that there are references to the second edition of Geschrei zur Mitternacht, a collection of J.C. Gleim testimonies, printed in 1758, but no reference to the collection of Ursula Mayer testimonies, Himmlischer Abendschein, published in 1781. A closer look at the Haupt=Register’s references to the Rock Sammlungen (yearbooks of J.F. Rock testimonies) narrows it further. We find references to printed volumes of the Rock Sammlungen up to number XIV (published in 1761) but none from XV (published in 1764) on. So we can safely assume a date of 1762 (or perhaps 1763).